When President Obama signed into law the Consolidated Appropriations Act of 2016, he did more than approve spending for a number of government agencies for the fiscal year of 2016. In Section 502, he also incentivized healthcare providers to transition from X-ray and computed radiography (CR) to digital radiography (DR)—and, in the process, help lower patient exposure to ionizing radiation. According to Guillermo Sander, Sr. Strategic Marketing Manager at Konica Minolta Medical Imaging and a member of the CR/DR group at Medical Imaging & Technology Alliance (MITA), the law applies to Medicare Part B, specifically outpatient radiology services delivered in hospital outpatient departments, free-standing imaging centers and physician offices. The expectation, Sander says, is that private payers will soon follow. Critical access hospitals are unaffected by the law, he adds, and there has yet to be any guidance on how it will be implemented. However, the law does allow for the use of a modifier on the existing CPT code. Sander says the law could be a good thing for radiology practices if it gets them to a more modern solution that streamlines workflow and promotes growth. Capturing a radiography exam could decrease from three minutes when using CR to 40 seconds when using DR.
As providers and institutions move to DR from CR, they should also consider the age of the radiography equipment in addition to the type of detector being used. The same IMV report lists the average age of X-ray equipment is 13 years, meaning many facilities will need to consider replacing the systems as well as the detector technology. By using the same detector technology across rooms and devices, the department can provide consistent image quality for the radiologists reading the studies, she explains. Maximizing an investment in DR and improving quality and throughput are discussions that FUJIFILM Medical Systems USA, Inc., is currently having with its customers, says Johann Fernando, Chief Operating Officer. “There are ways to save financial resources when transitioning from CR to DR by scaling back on the equipment while also increasing exam volume, especially in a portable environment,” Fernando explains. “Customers can go from six analog portable systems to half as many DR portables and increase their patient volume and workflow efficiency while lowering dose.” The goal, he adds, is to help customers do more with less. Converting from CR to DR can reduce dose by as much as 50%, and with Fujifilm’s Virtual Grid technology users can expect to achieve that level of dose reduction, he adds. Virtual Grid processing simulates grid use for exams acquired without a grid, so it eliminates physical grid-related misalignment issues, tunes image contrast, and emulates grid characteristics such as grid ratio, density and interspace material. While Fernando doesn’t envision CR becoming obsolete with the new law, he does believe that CR will take the place of film and be utilized more in non-radiology environments such as physician practices, urgent care clinics and potentially even at small-bed hospitals. At East Texas Medical Center, Director of Radiology Bill Tobin is overseeing the transition from CR to DR. A Fujifilm CR customer since 2007, he had to make the decision whether to replace the systems with “old” technology or convert to DR.
“In the long term, our reimbursement will be affected if we stay with CR, so we initiated a plan to convert all our systems, beginning with the trauma department,” Tobin says. “When we have five to six images in a radiography exam, we can shave 15 minutes off the total time, almost immediately display the images for the trauma physicians, and also reduce the dose,” Tobin adds. Tobin also recommends that other sites involve their IT department from the start. One hiccup in the transition was the hospital’s wireless network. There was a conflict with the frequency being utilized for other devices and that had to be adjusted before the DR plate could transmit images to the DR receiver. Even the best laid plans can change. When Derek Taylor, Director of Radiology at Memorial Hospital of South Bend (South Bend, IN) began planning for the conversion of film-based X-ray to DR at several health system owned outpatient centers in 2015, he and his team anticipated making the switch in 2017. Then, he read about the changes in reimbursement for film-based X-ray that would begin that same year. So, together with the director of radiology at Elkhart General Hospital (South Bend’s “sister” hospital), technologists from both hospitals and staff from the outpatient centers, Taylor and the team began developing the capital plan for the transition to DR. One key member was Kerri Hessey, an outpatient practice manager who organized all the meetings, kept the team on track, and compiled a lot of the data used to arrive at key decisions. The team worked with the finance department to outline the revenue that would be at risk; however, revenue wasn’t a strong enough argument by itself. “At the end of the day, it was the support of radiology and our physicians and the ability to improve efficiency and image quality along with reducing dose by 30% to 50% that helped us secure the funding,” he says. Also, being able to program specific views based on the type of exam—a feature the radiologists were keen to implement—would enhance consistency of the studies across the different sites. 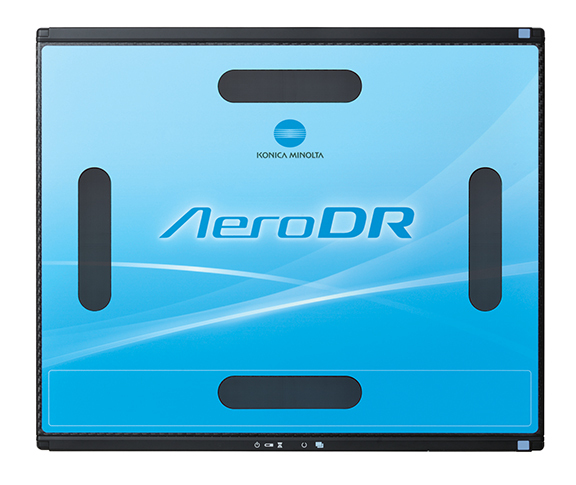 Beginning in July 2016, five outpatient film-based sites will be converted to the Konica Minolta AeroDR wireless flat panel detector. Four outpatient sites currently using CR will transition to the wireless DR panels in 2018. As three new outpatient centers open over the next two years, these too will be outfitted with DR technology. Memorial Hospital had previously converted two radiography rooms to the AeroDR X70, and six rooms and two portable X-ray units to the wireless AeroDR. With many sites—large and small—moving to DR from CR, an important consideration is the access to and management of digital images. While most hospitals will have a PACS installed, many outpatient center or group practices may not. Thanks to the 2015 acquisition of Viztek, Konica Minolta now offers the Exa platform, a scalable PACS that facilities can implement on a smaller scale and then increase capacity and capabilities as the facility grows. Sander adds that Exa PACS is an entirely web-based solution with a zero footprint viewer that offers full diagnostic toolsets and reading capabilities from any computer. DR is also helping enhance the quality of care provided to patients, Sander adds. When placing a tube or central line, such as a peripherally inserted central catheter (a PICC line), clinicians can now verify immediately at the bedside the proper placement. Sander also says that with the clinical speed of portable DR, customers also want better uptime, shorter panel charge time, and more durable panels. Konica Minolta has answered this need with the introduction of the AeroDR XE and the AeroDR LT detectors that are water/liquid resistant and deliver reliable, high-capacity imaging. At Fujifilm, in addition to the Virtual Grid the company has also launched the FDR D-EVO GL DR detector for single exposure long-length digital imaging. Rob Fabrizio, director of marketing and product development at FUJIFILM Medical Systems U.S.A., Inc., says the detector has a 17 × 49 inch field of view to eliminate the need for multi-exposure long-length studies. Historically, the inability of DR to capture single exposure long-length studies has been a key factor in hospitals and imaging centers maintaining use of CR. 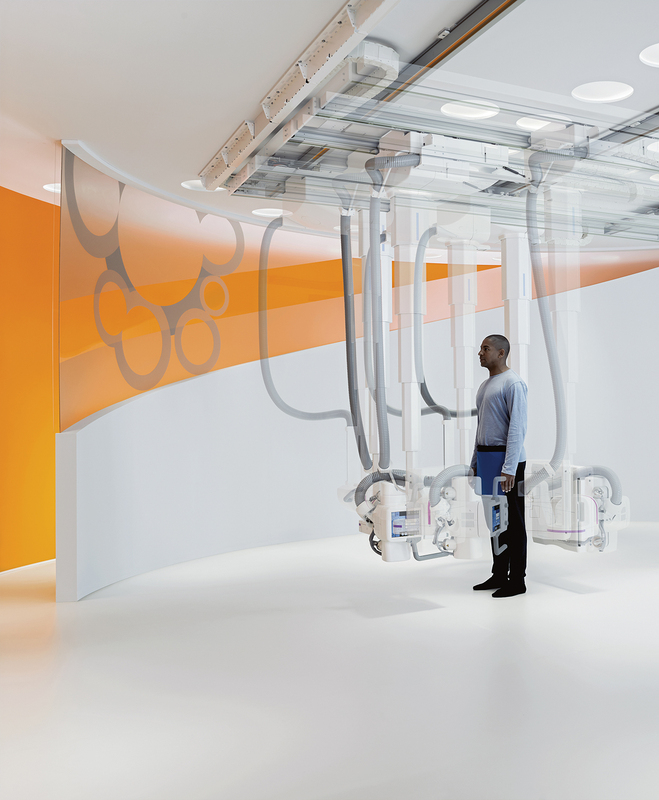 Siemens Healthineers has recently been focused on bringing new innovations to fixed rooms. 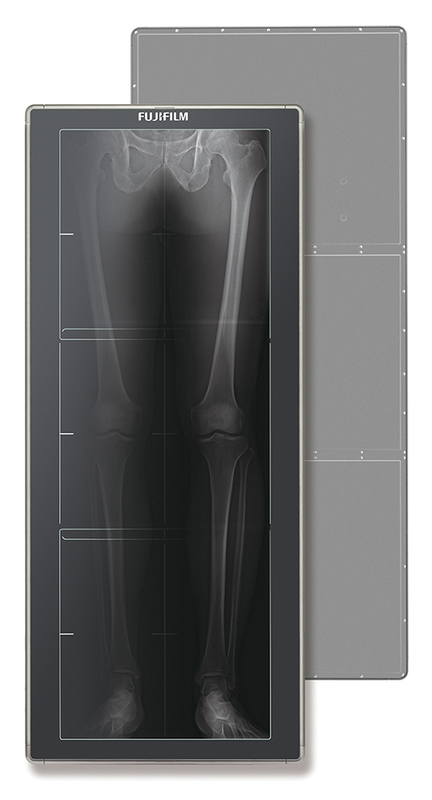 At RSNA 2015, the company launched Multitom Rax, a Twin Robotic X-ray system that can be used for radiography, fluoroscopy and angiography—with 3D imaging capabilities. “Our customers want to do more with their room so that it can address the different medical needs of their patients,” Fernandes says. Robotics is also emerging as an important trend in medical imaging—and not just in fluoroscopy and angiography. “If you think about a technologist performing 100 or more exams in a day, and with each patient they need to move the tube and detector, there is the potential for repetitive stress injuries,” she adds. With the robotic arm, the Multitom Rax automatically aligns to the patient based on the type of exam. If needed, the system can even capture a 3D cone beam CT for bone studies. Doing more with less: More throughput, faster exam times, consistent imaging and less radiation dose exposure for patients—these are the value propositions that DR provides to facilities of all sizes and types as they seek to transition from CR to DR.
Rules committee print 114-39 text of house amendment #1 to the senate amendment to h.R. 2029, Military construction and veterans affairs and related agencies appropriations act, 2016. Available at: http://docs.house.gov/billsthisweek/20151214/CPRT-114-HPRT-RU00-SAHR2029-AMNT1final.pdf. IMV 2013 X-ray/DR/CR Market Outlook Report. Editor’s note: For more information on transitioning from CR to DR, MITA has a list of FAQs that can be found at: http://www.medicalimaging.org/2016/02/22/medicare-to-incentivize-transition-from-traditional-x-ray-to-digital-radiography-starting-in-2017/. Massat MB. Changes in reimbursement to propel digital radiography. Appl Radiol. 2016;45(7):24-27.